We all know how good salmon is for us, especially when it’s wild caught off of the coast of Alaska. It’s full of essential Omega 3 fatty acids (the good kind of fat that keeps your brain and heart working well). It’s high in protein, too. I make salmon at least once a week and I love trying new recipes to keep it fresh and interesting. I decided to try this recipe posted by my friend Pronto Pup. He is a much funnier (and profane) blogger than I ever hope to be but he’s also a great cook. It’s fun to read his cooking blog for new ideas. He’s got kids around the same age as my daughter, so I get good insights into what recipes might be “child friendly”. My daughter is a pretty adventurous eater but anything spicy still can be hard for her to eat. He observed that this salmon recipe was a bit too spicy for his kiddos so I toned down the crushed red pepper in my version and my daughter really enjoyed it. I think she prefers my lemon pepper garlic version but she still ate a good amount of this. The original version is posted here (thanks Little Spice Jar!). I did one thing slightly different than directed, which was to brush about half of the chipotle sauce onto the salmon before cooking and then reduce the sauce even further on the stovetop to use as a glaze after the salmon was finished. The glaze was too strong for my daughter but my husband and I really liked it. It had a full lime/honey/chipotle flavor and added some extra moisture to the fillet. 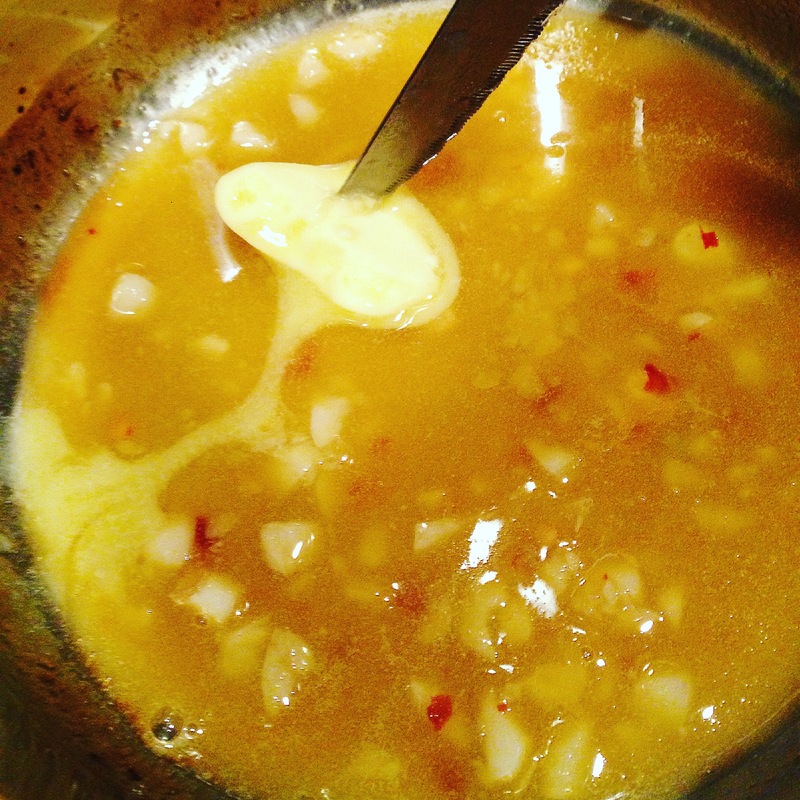 Here’s the sauce as I’m incorporating the butter. It’s really rich and yummy. 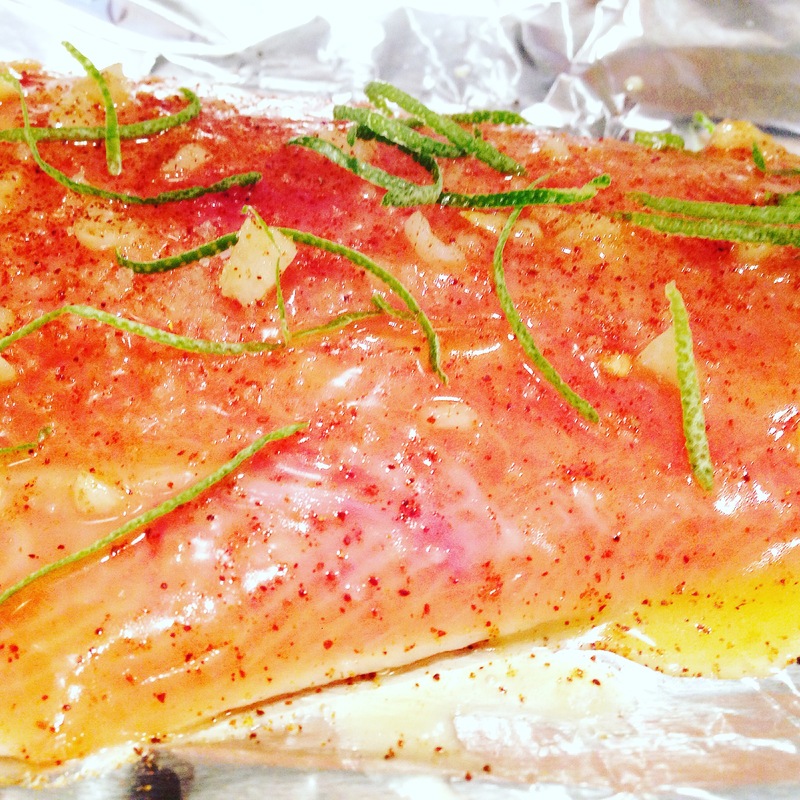 The preparation for the salmon is so easy, and cooking it was pretty foolproof. 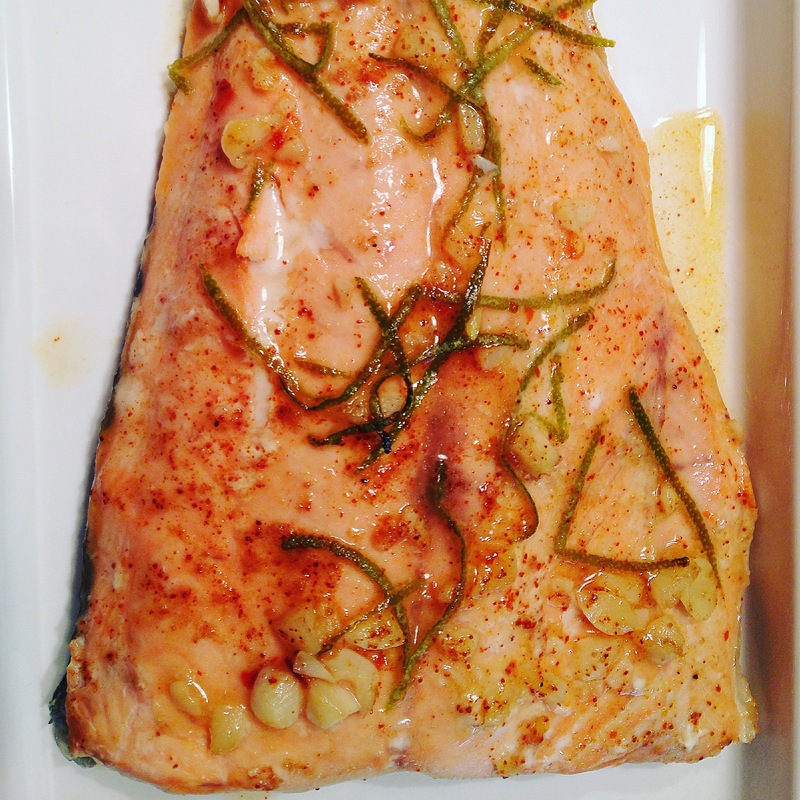 The salmon prepared with chipotle butter sauce and lime zest. Just wrap it up in the foil and bake in the oven. I love that I didn’t have to clean a roasting dish afterwards. I usually make a roasted veggie on the side but since I was making dessert (check back for the recipe and review on that!) I felt pressed for time and did corn on the cob and frozen green beans instead. I will absolutely make this dish again and can’t wait to try tweaking the flavors a bit next time just for the fun of it.